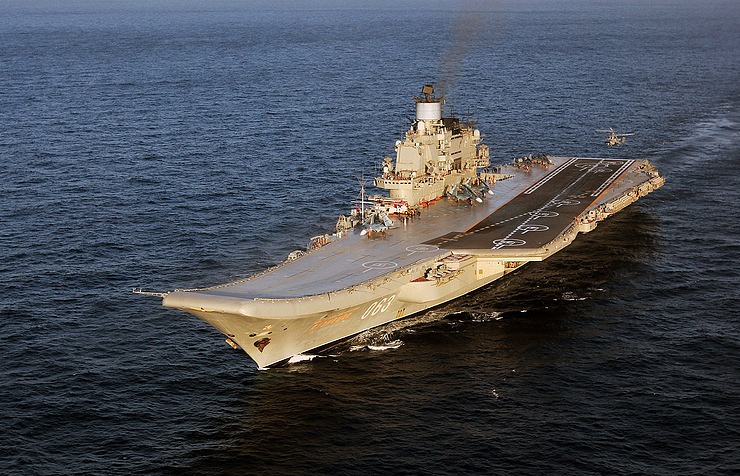 As Russian Deputy Defense Minister Yuri Boris said earlier, the warship’s repairs are expected to be completed in 2020 and the aircraft carrier is planned to come into operation again in 2021. The Admiral Kuznetsov will be repaired at the Shipyard in Murmansk in northwest Russia. The Admiral of the Fleet of the Soviet Union Kuznetsov is a heavy aircraft-carrying cruiser. As of 2018, it is the Russian Navy’s largest warship and its sole aircraft carrier. The Admiral Kuznetsov is part of the Northern Fleet and is the Russian Navy’s flagship. In the postwar period, there was no common view in the Soviet leadership on the need for aircraft carriers and possible methods of their deployment. Some politicians, industrialists and commanders spoke for the construction of large nuclear-powered aircraft carriers similar to the US Nimitz warship. Opponents, however, pointed to the high cost of the program of building aircraft carriers and emphasized the development of the submarine fleet. As a result, there were no aircraft carriers in the Soviet Navy until the 1980s capable of carrying horizontal take-off and landing aircraft. Meanwhile, Project 1123 and Project 1143 cruisers were built for antisubmarine warfare, which was proclaimed a priority for the Soviet Navy’s surface fleet. These warships accommodated helicopters and also Yak-38 vertical take-off and landing aircraft. By their combat capabilities, these warplanes were less efficient than normal aircraft, which prompted the Navy’s command in the early 1970s to return to the plans of creating a large aircraft carrier capable of providing for aviation’s operation at a considerable distance from the fleet’s bases. Project 11435 was developed in the early 1980s. In the process of designing, specialists gave up the idea of installing catapults on the warship: instead, the aircraft carrier was furnished with a ski-jump in its front part, which limits the takeoff weight of aircraft. Besides, the aircraft carrier was armed with P-700 Granit missiles as powerful strike weapons. 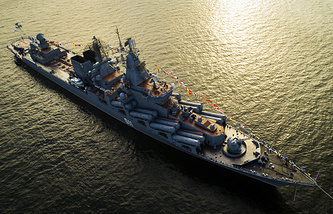 As a result, the Navy qualified the Project 11435 warship as a "heavy aircraft-carrying cruiser." Initially, the lead warship was expected to be named the Soviet Union. In 1982, the aircraft carrier got the name of Riga. In late 1982, it was renamed into Leonid Brezhnev (in memory of the late CPSU Central Committee secretary-general). In 1987, at the beginning of perestroika and criticism of the stagnation period, the aircraft carrier was renamed into Tbilisi. Since October 1990, the warship has been called the Admiral of the Fleet of the Soviet Union Kuznetsov in honor of Nikolai Kuznetsov who headed the Soviet Navy in 1939-1947 and in 1951-1955. The warship was laid down at the Black Sea Shipyard (Nikolayev, currently on the territory of Ukraine) on September 1, 1982 and floated out on December 4, 1985. On October 21, 1989, it was put to the Black Sea where it carried out a cycle of aircraft’s flight development tests. On January 20, 1991, the warship joined the Soviet Navy’s Northern Fleet. The warship’s operation was complicated by the absence of financing and the required coastal infrastructure. In particular, many problems emerged with the main propulsion unit whose boilers constantly went out of order. By April 2018, the aircraft carrier had performed seven distant-water voyages, including six to the Mediterranean Sea (1995-1996, 2007-2008, 2008-2009, 2011-2012, 2013-2014 and from October 15, 2016 to February 8, 2017) and one to the North Atlantic (2004). In 2000, the Admiral Kuznetsov was involved in rescue operations to render assistance to the sunken submarine K-141 Kursk. During its seventh mission in distant waters, in November 2016 - January 2017 the warship took part in combat operations for the first time: its deck-based fighter jets delivered strikes against the infrastructure of Islamic State and Jabhat al-Nusra terrorist organizations (outlawed in Russia) on Syrian territory. Overall, the pilots of deck-based aircraft performed 420 sorties, including 117 at night, and destroyed 1,252 terrorist facilities. The warship underwent repairs in 2001-2004, 2008 and 2015. - crew: 1,960 men, including 518 officers and 210 ensigns. The main propulsion unit is the boiler and turbine system comprising 4 steam turbines with a capacity of 50,000 horsepower each. The warship is equipped with 9 turbine generators and six diesel generators with a capacity of 1,500 kW each. - Udav-1 anti-torpedo multiple launch rocket system. 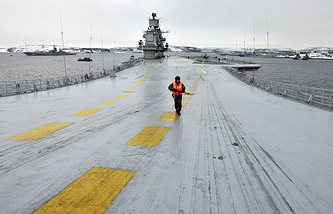 The aircraft carrier Admiral Kuznetsov can carry 26 aircraft and 24 helicopters on the flight deck and under the deck. In the summer of 2016, trials of the renewed air group comprising new deck-based MiG-29K/KUB fighter jets started aboard the warship. During its voyage towards the Syrian coast in 2016-2017, the shipborne Ka-52K Katran attack helicopter was tested.